This is a way more ambitious film than I had expected based on the trailers. Gosh, it's 2 hours and 7 minutes of wall to wall CGI. As such, I cannot dismiss it out of hand for the silliness it is, if only because of my respect for those who worked—nay—toiled for what must have been a very, very long time. I'm not quite sure how to describe it. Something like Clash of the Titans + The Mummy + Transformers, with a little bit of a Lord of the Rings journey. It's not a good film, and with a predicted $15m opening weekend for a $140m budget, well, I suspect it'll be DOA and not a trilogy starter. That's too bad because, again, it's quite the spectacle. Unfortunately, it suffers from countless groan-inducing moments, lots of bad acting, a few rush-job scenes, terrible pacing, and just outright stupidity sprinkled throughout for good measure. Like Exodus: Gods and Kings and Pan, perhaps its Achilles heel shall prove to be the tremendous amount of whitewashing. It's actually quite astounding, particularly given the context, setting, and content. I found the incongruity distracting, if not initially jarring. Geoffrey Rush as Ra? Come on; gimme a break. Similarly, Australian, Danish, Scottish, and French accents abound in this otherwise homogeneous desert. 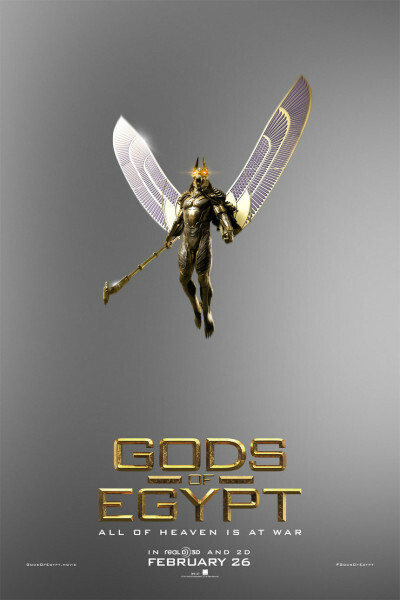 In light of the omnipresent Academy Awards' kerfuffle, I think Gods of Egypt will land at precisely the worst time imaginable and be received about as well as farts in a tent. If there is anything redemptive about this film—anything at all—it is that it means well. It really does. It is eventually rather earnest, and ends with last gasps and soliloquies espousing, literally, "the importance of good deeds, selflessness, and generosity in this life." In this regard, it conceptually stands head and shoulders above several moments in the ever-disheartening Presidential campaign, though equivalent in periodic spectacle, gladiatorial combat, and circusy atmosphere. Regarding the campaign, I leave you to your choices; just be sure and vote. Regarding the film, I shall only add that I very much look forward to this weekend's Eddie the Eagle, March's Midnight Special, Green Room, and 10 Cloverfield Lane, and April's Criminal with Kevin Costner and Ryan Reynolds.